Budapest’s New Main Street between Kálvin tér and Szabadság tér in district V. is a new pedestrian-friendly area of the city center. 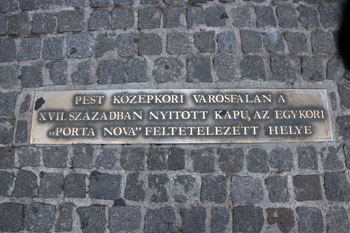 The first phase of New Main Street between Kálvin tér was inaugurated on Easter Monday, 2010. 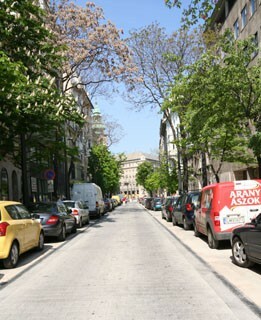 The “New Main Street of Budapest” project is 3 km stretch running parallel with the Danube and includes Kecskeméti utca, Egyetem tér, Ferenciek tere, Petőfi Sándor utca, Erzsébet tér, Október 6. utca, Szabadság tér and Honvéd utca. During the second phase of the project Ferenciek tere got revamped into a spacious more plesant square. This part has been completely refurbished with new, more durable and aesthetic pavement, modern, elegant street lamps, benches, rubbish bins, and bicycle racks. 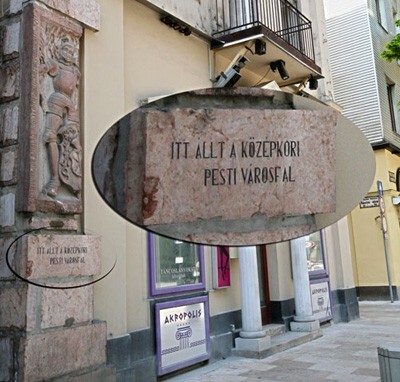 The Kálvin Square end of Budapest’s New Main Street starts with Kecskeméti utca that includes a relic of the city’s history: part of Pest’s medieval city wall next to a cheesy nightclub entrance. In the middle ages Pest and Buda were separate settlements. At that time Pest (today the Inner City part of district V.) functioned as the outskirts of Buda and developed into a thriving crafts and trade city. The city wall was built during the reign of King Matthias (1443-1490) following the line of today’s Deák Ferenc utca-Károly körút-Múzeum körút-Kálvin tér-Vámház körút. The thriving of Pest came to a stop during the Turkish occupation of the city. It started to revive in the 18th century when the city walls prohibited large-scale construction projects, so they were pulled down or incorporated into buildings. Parts of it can be still seen today (see the photo above). Much of the traffic is diverted from the New Main Street, only public transport buses and some other vehicles are allowed to drive through. Only Petőfi Sándor utca-Bécsi utca between Ferenciek tere and Harmincad utca remains open to traffic without any restrictions. 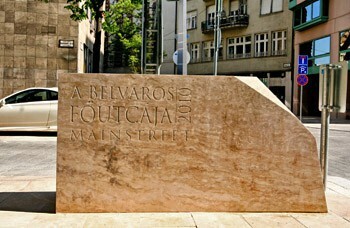 Besides reduced traffic, the area between Kálvin tér-Egytem tér received a new, modern streetscape. 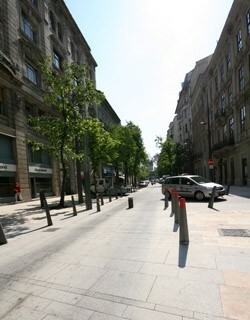 New, more durable street covers were used. There are benches to take a break on during a walk or just to sit down for a while. The new street lamps are not only more decorative but consume less electricity than the older lighting system. My favorite part of the southern stretch of New Main Street is Egyetem tér. One of Budapest’s best cafes, Cafe Alibi was next to the Eötvös Lóránd Tudományegyetem, a prominent University of Hungary. sadly the cafe closed in february 2016 and a faceless, overpriced Starbucks took up its place. 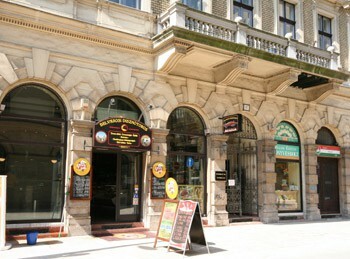 The square and cafe is mostly frequented by university students. Coffee was very good in Alibi, made from freshly roated beans, which is unfortunately a rarity in Budapest – a city that once had a thriving coffee house culture. TIP: Skip Starbucks and stop by Centrál Cafe at 9. 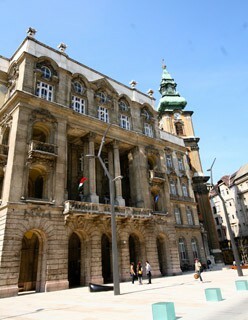 Károlyi Mihály utca (at the corner of Irányi utca), a fine example of the before mentioned historic coffee house scene with spacious and elegant Art-Nouveau interior. Do devote some time to the lovely twin-tower church adjacent to the University building at the corner of Egyetem tér and Papnövelde utca. 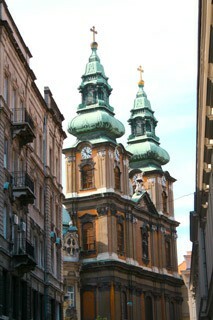 It is one of the most beautiful Baroque churches of Hungary from the 18th century. The Pauline order, the only order of monks with Hungarian origin, had the church built on the site of a former Turkish mosque. The exterior features a tympanum and a row of pilasters that divide the façade. 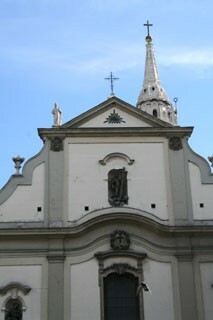 The emblem of the Pauline Order is flanked by statues of St. Paul and St .Anthony. A thick wooden door adorned with rich carvings leads inside the single-aisle church. The baroque paintings on the vaulted ceiling are the works of Johann Bergl from 1776 and depict scenes from the life of the Virgin Mary. The carved main altar represents the birth of the Virgin Mary and was made by Conti Antal Lipót. A copy of the painting Black Madonna of Czestochowa in Poland stands at the centre of the altar which was probably made in 1720. If you long for a traditional hearty Hungarian meal then try Belvárosi Disznótoros on Károlyi Mihály utca (opening hours: Mon-Fri: 7.00-20.00, Sat. 7.00-15.00). It is a buffet-style joint where you eat your food standing up at the counter. The menu includes a choice of roasted meats (poultry, pork, beef), spicy sausages, hurka varieties (black pudding Hungarian style). Grilled meat slices made to order are also available. Pickles, coleslaw, potato salad, slices of white bread are offered to go with the meat dishes. Prices are not higher than in a ordinary butcher shop:: cc. 200-300 HUF/100 g sausage/black pudding. 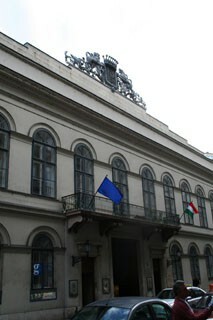 The Neo-Classical Károlyi Palace in Károlyi Mihály utca today houses the Museum of Hungarian Literature and the Petőfi Exhibition dedicated to the famous poet of the 1848/49 Revolution and War of Independence Petőfi Sándor. 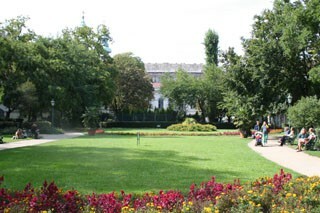 The lovely Károlyi Park is a green serenity of the Inner City. Fountains, flowery park with walkways and benches invite visitors for a bit of rest. 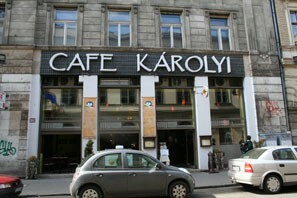 Cafe Károlyi is a nice stop for coffee and cake, or Italian style food if you’d like to have a lunch or dinner. Ferenciek tere got reconstructed during the second part of the Main Street project in 2013. It received new benches, pavemnt tiles, and lamps, though they hasn’t managed to reduce car traffic. A Franciscan Church and monastery (after which the square got its name) have stood on the site of the present Baroque-style church since the 13th century. After the liberation of Budapest the monks regained the building. The most notable sight is the Baroque main altar with sculptures dating from 1741 and 1851. 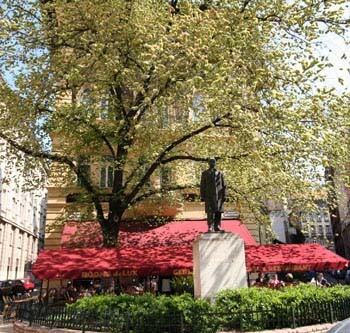 Kárpátia Restaurant, a typical touristy (meaning rip-off) place in central Budapest, is at Ferenciek tere. 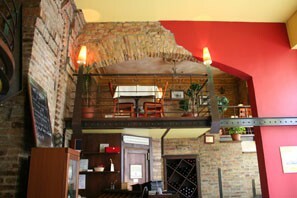 According to their marketing they specialize in traditional and contemporary Hungarian gastronomy. Although there are very few good restaurants offering good Hungarian food in Budapest based on the many complaints by both tourists and locals I encountered online, you’d better skip Kárpátia. 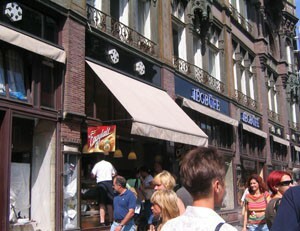 Jégbüfé Cake Shop (moved to Petőfi Sándor utca 3., 400 m/5-minute walk from Ferenciek tere)) is another famous element of the communist era offering a wide assortment of creamy cakes, pastries and ice cream in summer. Quality of cakes and coffee was much better in the old times; today the are made with too much gelatine and other artificial additives. You can get better cakes in other cafes and confectioneries (e.g the Cafe Károlyi mentioned above), but their gofri – waffles with chocolate, vanilla pudding or jam filling – is still quite good. The good thing is that it is open every day from 7.00 (from 8.00 on Sunday) till 21.30. Cafe TIP: If you think that life is too short to drink bad coffee head for Madal Espresso & Brew Bar at Ferenciek tere. It is a third-wave coffee shop that opened in 2015 (their first shop is in Hollán Ernő utca near Margaret Bridge in Pest, distr. XIII.). They use specialty coffee beans that are roasted with care in their own roaster, Beanlight, but you can also taste coffees by other quality small roasters located in Europe. 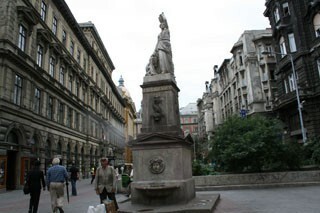 The tiny romantic square is dominated by the statue of Kamermayer Károly. Behind it is a Parisian-style bistro, Gerlóczy Cafe. The terrace is packed with tables and is usually full with tourists during lunch time. TIP: From here the renewed Kossuth Square with the Parliament building, lots of green and less car traffic, is just a couple of minutes by walk. There’s an underground visitor centre and you can also explore the huge building on guided tours. 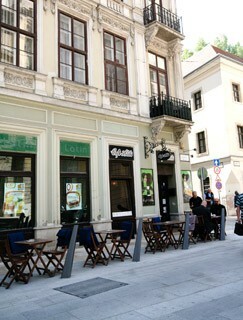 The First Strudel House of Pest (Első Pesti Rétesház) is located on the New Main Street on Október 6. utca, near St. Stephen’s Basilica. 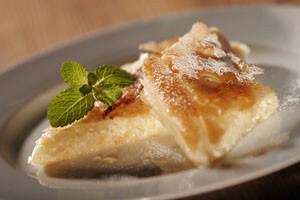 You can taste s delicious Hungarian pastry, strudel there. Available both with sweet and savoury fillings this delicacy is a perfect mid-day snack with a cup of coffee. Note: the First Strudel House of Pest Cafe & Restaurant is open on Christmas Day (25. December) unlike most restaurants in Budapest.